This video shows you how to set up Duet 2 in GarageBand and begin recording quickly. For the purpose of this tutorial, choose electric guitar in the New Project Window. You should now see GarageBand open with a single track and a default guitar amp. Click on GarageBand,Preferences, and then Audio/MIDI. You will see a message asking if you really want to change the audio driver… Choose Yes. 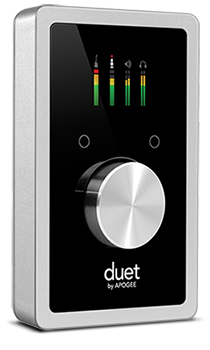 To experience the full audio resolution of Duet, select “Advanced” and for Audio Resolution select “Best”. Close the Preferences Window. click on the amp so that you see it’s controls below. and then select the input source. Since we created a guitar track in GarageBand, we will choose “Instrument” and plug a guitar into Duet’s 1/4″ instrument input. We have ” instrument” selected, so you will see the guitar icon is lit. Press record in GarageBand’s transport control, and begin recording! If you are using a condenser microphone, you will also need to click on the “48” button to turn phantom power on. Now adjust levels, and Record!